A cake is for celebrations. The mere sight of a cake brings on the celebratory mood. Everyone cheers up when they see something to forward to at the end of the meal. 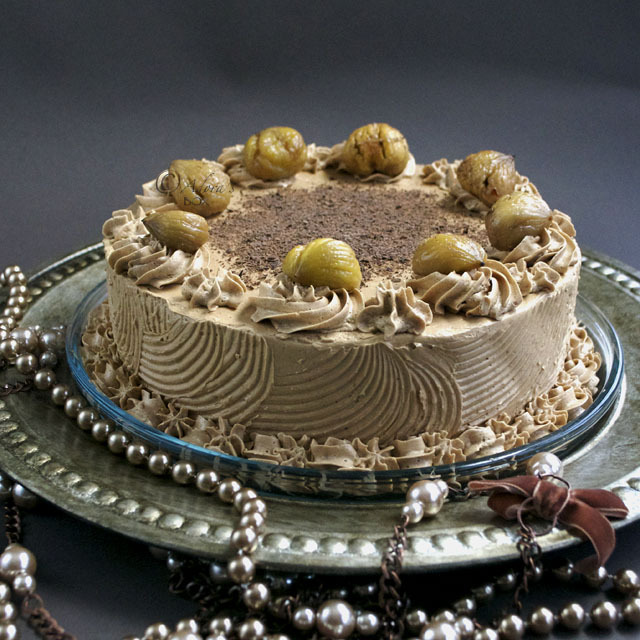 Decadence is the trend for cakes. There's no holding back. 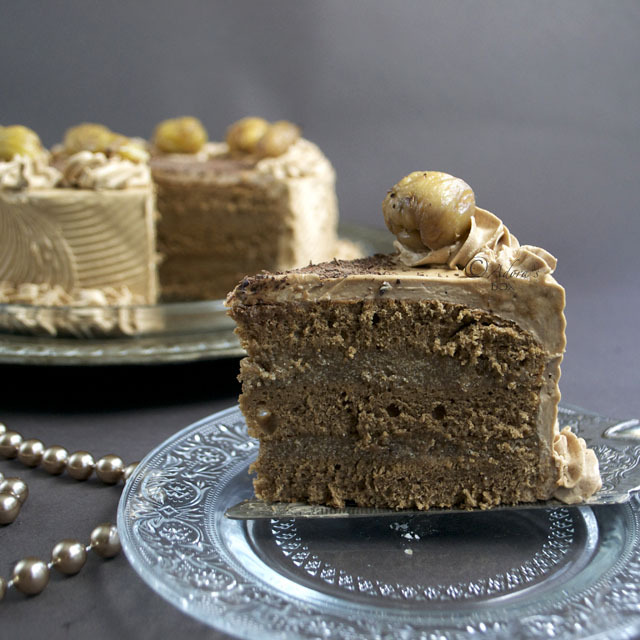 This cake combines mocha chiffon cake layers, chestnut cream and rich mocha buttercream icing to make an indulgent dessert. 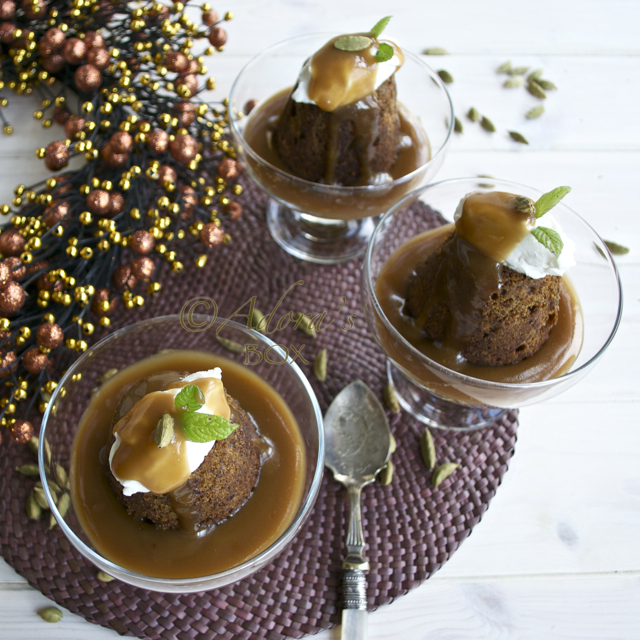 The combination of flavours to results to a cake is the perfect finale to a special meal. Pre-heat the oven to 350° F/180° C. Line three 9" diameter cake pans. Combine the flour, cocoa powder, baking powder, salt and 1/2 c. sugar in a mixing bowl. Make a well in the center, and add in the egg yolks, espresso coffee, vanilla and oil. Mix thoroughly with a whisk until free from lumps. With an electric mixer, beat the egg whites and cream of tartar together until foamy. Add the remaining 1/4 c. of sugar and whisk until stiff but not dry. Mix a spoonful of the egg whites into the batter to slacken the mixture and make it easier to fold. Using a large metal spoon, fold in the batter into the egg whites. Divide the mixture evenly into the three baking pans. Bake for 20-30 minutes or until a cake tester comes out clean. Invert the pans into cooling racks and leave to cool. Prepare the filling by mixing all of the ingredients, except for the quartered cooked chestnuts. refrigerate for at least an hour. For the icing, beat the butter with an electric mixer until light and fluffy. Add the cream and mix well. Combine the rest of the ingredients in a separate bowl and with the mixer running, drizzle a little bit at a time into the whipped butter, mixing until well combined after each addition. 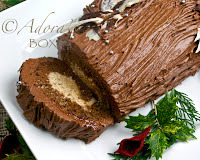 You will need 8 whole peeled cooked chestnuts and grated chocolate or sprinkles for decoration. Lay one of the sponge layers on a serving plate. Tuck four strips of greaseproof paper under the cake to surround it and protect the plate from mess. 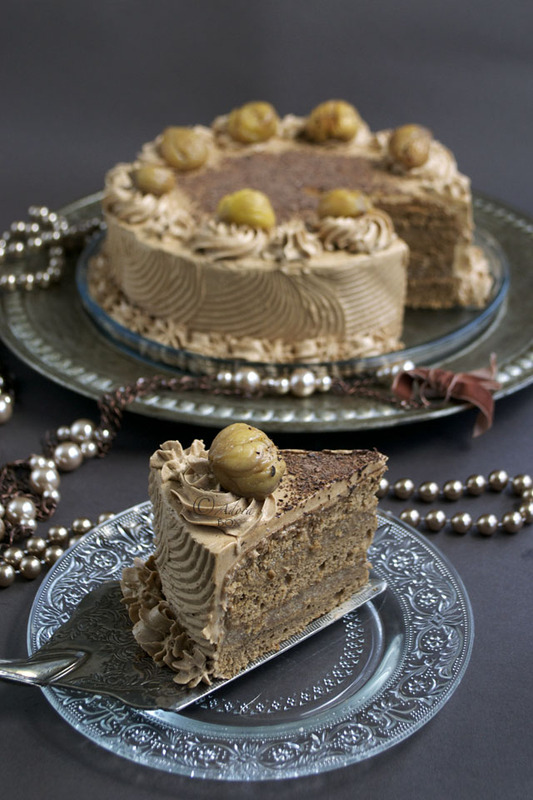 Top the first cake layer with half of the chestnut cream filling. Sprinkle the quartered chestnuts, if using. Top with another cake layer and spread with the rest of the buttercream. Sprinkle the quartered chestnuts and top with the last cake layer. Frost with a thin layer of the mocha butter cream icing on the top and sides as a crumb coat. Use the rest to frost the whole cake decoratively. Decorate with whole chestnuts and chocolate sprinkles. That looks so good. I love this recipe. 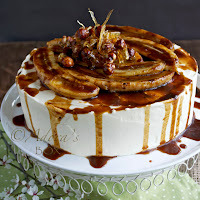 This looks and sounds decadent, I would love a piece! 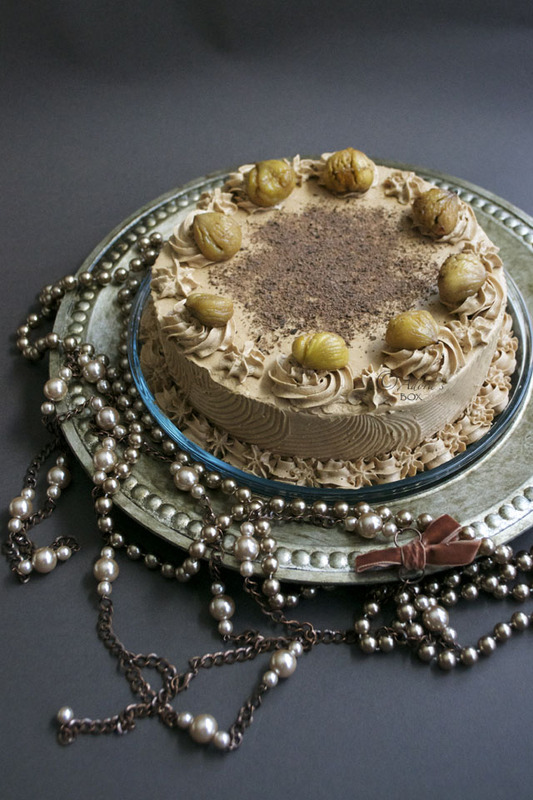 one of my kitchen resolutions this year is to bake more... maybe ill start with this mocha and chestnut cream gateau hmm adora you inspire me. I love cake! I make a similar one but my icing is a little different. I don't use evaporated milk in mine. But, I like the thought of having it in there so next time, I am going to make that addition. Adora, I'm supposedly on a diet (ha! ), but your post did it for me. I'm off to buy the ingredients for this cake. 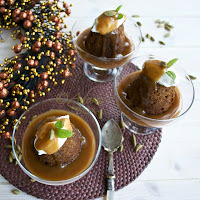 Looks decadent indeed! I actually lived in London (well, just outside in Northwood, near Uxbridge) for 3 years. I loved it! Your recipes look great! Chestnut cream! yes please. What a good idea to pair the mocha's bitterness with it. Chestnut cake is very popular in Japan but I rarely see them in USA. 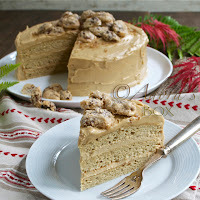 I made chestnut cream cake before too but this looks fantastic! I have to minus mocha part though because I don't drink coffee. Thanks for the recipe.